Talk Nerdy To Me: Technology Behind the New Years Ball Drop. Technology Behind the New Years Ball Drop. I covered this story on CNN today and thought it was talknerdy worthy! Up to a million people will watch the ball drop in Times Square and over a billion will watch the vid - but not many know about the actual technology behind it! Here are the deets. The first Times Square New Year’s Eve celebration was held in 1904 but there wasn't a ball drop until 1907. Over the past 102 years, seven versions of the Ball have been designed to signal the New Year. In 1907 the first Ball was made of iron and wood, weighed 700 pounds, and was covered with 100 light bulbs. A sort of pulley system brought it down a flag pole as opposed to a 'drop'. Since then there have been a variety of iterations. - 1920, a 400 pound iron Ball replaced the iron and wood Ball. - 1955, a 150 pound aluminum Ball with 180 light bulbs replaced the iron Ball. - 1995, the aluminum Ball was upgraded with aluminum skin, rhinestones, and computer controls. - 1999, the crystal New Year’s Eve Ball was created to welcome the new millennium. 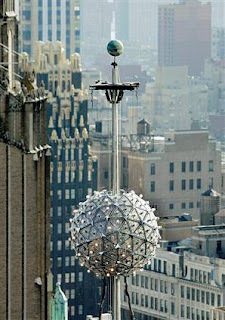 - 2007, modern LED technology replaced the light bulbs of the past for the 100th Anniversary of the New Year’s Eve Ball. - 2008, the permanent Big Ball was unveiled atop One Times Square where it sparkles above Times Square throughout the year. The Ball is now a geodesic sphere, 12 feet in diameter, and weighing in at 11,875 pounds. The Ball is illuminated by 32,256 Philips LEDs (light emitting diodes) which can be digitally controlled to create billions of patterns with over 16 million colors in the palette. The Ball is covered with a total of 2,688 Waterford Crystal triangles that vary in size, and range in length from 4 3⁄4 inches to 5 3⁄4 inches per side. The Crystals make the ball heavy (not the LEDs). Using LED technology; 88% reduction in electricity consumption - and the ball will consume only as much as it takes to operate two traditional home ovens per hour. 2.) Since the ball is now a permanent fixture in Times Square it is used more than once a year - for example they give tours and also light up the ball for Valentines Day. They have had no major issues in repairing the ball to date. *Special thanks to Philips and the Times Square Alliance for the facts!